LOOKING FOR SERIES 32 EXTENDER BACKSHELLS? SEE and COMPARE the benefits of EA Series 310 Competitive Products! Series 310 Extender Backshells are used where wire service loops are required or, in-line wire components such as diodes, resistors and miniature printed circuit boards need to be stowed. 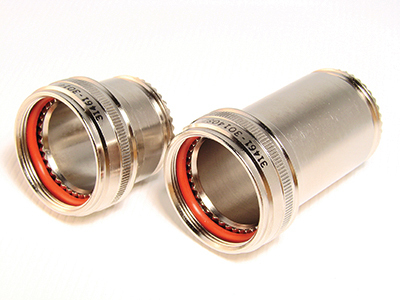 The extra benefit of wire service loops is for the insertion of crimp connector contacts that are inserted into a connector. This Extender Backshell also aids in the cable rebuilding process instead of chopping off a terminated connector in favor of a costly replacement. We offer a number of configurations in straight, 45 and 90 degree. 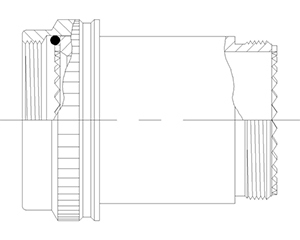 Spin coupling and direct thread are available. Choice of plating is listed on the drawing link below with dimensions, connector codes, length options and entry sizes to choose from. Electro Adapter furnishes a large assortment of Adapters and cable assembly backshells for all Military style cable connectors. Cable transitions, dust caps, clamps, shield terminations in RFI/EMI, cable sealing Backshells and conduit adapters to suit all Aircraft, Weapons, C4RSI surveillance, combat radio systems, launch and payload applications. Electro Adapter will cross Glenair, Sunbank, Amphenol, Isodyne and Palomco part numbers. We also are a Qualified Parts List manufacturer for AS85049 to the Military and OEM cable builders.